American Idiot was the album that got me into rock. It was released at a pivotal point of my life, just a week after the event that changed everything. Overnight, my whole personality changed and Green Day were the soundtrack to this transition. I was completely obsessed with them (until I discovered My Chemical Romance a couple of months later!) and the album insert is to this day covered in clay fingerprints from the repeated listens in my sculpture class. Although I'd moved on from Green Day by the time 21st Century Breakdown was released, American Idiot is still an album I hold very close to my heart, so I was eager to see the musical. My brother mentioned that he was going to see it in Manchester so I tagged along without really knowing anything about the show at all, other than the fact it was based on the songs of the album. We had seats right at the back of the stalls in Manchester's Palace Theatre and I was a bit freaked out by how steep the incline was, but we had a really clear, unobstructed view of the stage. Perhaps because it was a Thursday evening, the theatre was only about 75% full so I had nobody sitting in front of me, which certainly helped with the view, although it did lessen the atmosphere somewhat. While the audience was being seated, a TV on stage showed clips of 9/11 and George W Bush making grandiose claims, which was to become the setting of the play. 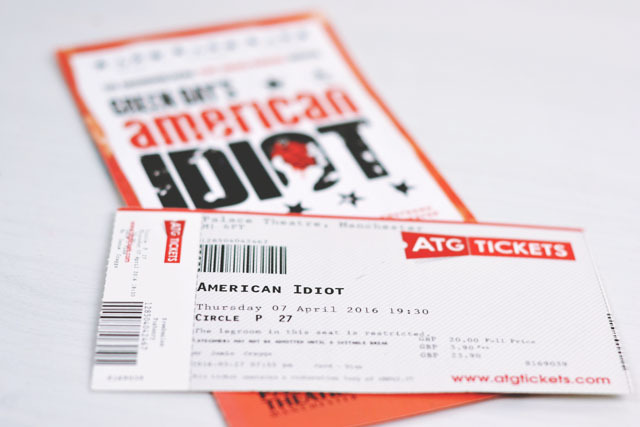 Opening with the iconic American Idiot, the play shows a group of young friends feeling disillusioned with their life in the suburbs and, as Jesus of Suburbia kicks in, we get a sense of their restlessness. I found this beginning did a really good job of capturing what it was like to be a young person post-9/11; that sense of hopeless apathy was perfectly portrayed. The plot progresses as the three main friends take different paths in life. Theo signs up to the army, Tunny stays in his hometown with the responsibility of a young father while our protagonist Johnny moves to the city and, together with his alter ego St Jimmy, struggles to balance his love for his girlfriend and hard drugs. There was very little spoken word between the songs and I did find this made some of the plot a bit hard to follow. Although it wasn't complicated (if anything, it was quite weak), it wasn't explained too well. This is with the advantage of me knowing the words to the album. I'm not sure if it was a sound issue, but the vocals were often difficult to make out- although Emma Housley as Heather was an exception with her clear enunciation- and I can only imagine this would make it even more difficult to keep up. Almost all of the songs were those from the album, in chronological order, although it also included a mix of B-sides (Too Much Too Soon was a great inclusion), songs from 21st Century Breakdown and international releases of American Idiot ,and a couple that were written for the musical. As the plot was so simple, it seemed to be stretched out to fill time and the middle of the play felt lacking, especially a bizarre dream sequence that didn't add anything at all (apparently this is usually performed as an aerial ballet scene which I can imagine would be much more spectacular than the somewhat limp alternative we got). Extraordinary Girl, the song that was used for this scene, would have been so much easier and more effectively placed elsewhere so this whole scene felt a little redundant. Another issue I had with the play was that there was no real character development. Johnny's relationship with Whatsername (played by Amelia Lily, who has an incredible voice but was severely underused) was very much "I met this girl. Oh, we're a couple now. FYI, we're now having issues". By the end of the play, I didn't really care about either character or their relationship. However, despite all of these points, there were some really strong moments that really made the play. Its strength is in the simple, stripped-back scenes- both 21 Guns and Wake Me Up When September Ends were hugely moving with their understated orchestral arrangements and focus on vocals. Likewise, the most simple plot line used- that of the relationship between Tunny and Heather- was the most powerful, perhaps because of how commonplace their story is. Lucas Rush was spectacular as unhinged, flamboyant St Jimmy, throwing himself around the stage with reckless abandon, and there was a very clever use of repetition that really made us think about his character. Although I found the show waned in the middle, it definitely picked up at the end. Homecoming gave me goosebumps, especially when it was followed up with a more poignant ending. I've never liked Whatsername as the last song on the album, feeling it was a fairly weak song that took away the impact of the rest of the album. However, when I saw it on stage, I finally felt like I realised what Green Day were aiming for and have a new-found appreciation for it. By the time the encore started, I was reflecting on my own life and how time moves on. "Is this the end? Or is it a beginning?" asks Johnny, and stirred all sorts of emotions inside me, with maybe a little tear welling up. I suppose any jukebox musical is going to struggle with fitting a story around existing lyrics, but American Idiot more than made up for this with the rousing musical performances and portrayal of youth culture in the 2000s. If you have a soft spot for Green Day in your heart, I definitely recommend it! Oh, and if we're basing musicals around mid-00s rock albums now, may I throw The Black Parade into the ring? I hadn't realised that they had decided to make this a musical, shame it wasnt the best in the middle but I can see how maybe it is hard to string a storyline to an album already. Great review. I think it really helps with these sorts of shows if you have some kind of affinity with the music as it helps to pull it all together! I think I'd enjoy this but not sure it's one I'd rush out to see! I've heard quite a bit about this recently, so it's interesting to hear your thoughts on it. I love musical theatre, so I *hopefully* will get to see this at some point. It's a shame about the middle section, maybe they'll re-work it and find a way to keep the momentum throughout the performance? A few people I know of have seen this musical more times than I can count, and after hearing your review I'm not completely sure why! It sounds like one of those that I'd like to go see, and would enjoy, but it wouldn't really stick with me. This sounds really brilliant, actually, would love to see it. I had a re-obsession with that album a few months ago, had forgotten it for years and then BOOM. So good.